Leafs from Rivers: Goalie Contracts: How do they work? Goalie Contracts: How do they work? Recently, I had an idea to revolutionize goaltender contracts. I was going to derive a function based on existing goaltender contracts versus their Sv% to assess what a goalie is worth based on how they played. After looking at the data I got some interesting, but not useful, results. So, first things first, here's what I looked at. I gathered every significant (played a few games in the NHL) goalie contract from the last 7 seasons (2007-2014). I then gathered their save percentage numbers (at 5v5 only, because penalty kill save percentage is hardly an indicator of the goaltender's ability, but rather the ability of the penalty kill unit) in the years before their contract and the years during their contract. Then, I took their cap hit of the contract, and divided it by the total salary cap in the year that it was signed, to get a more even representation of cost throughout a span of years where the cap rose by $20 million. 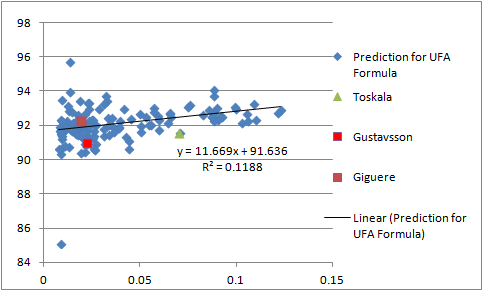 Taking all this data, I split them into UFA, RFA and ELC contracts, and then plotted their save percentages versus their cap hit percentage. This generated 5 graphs which are shown below. 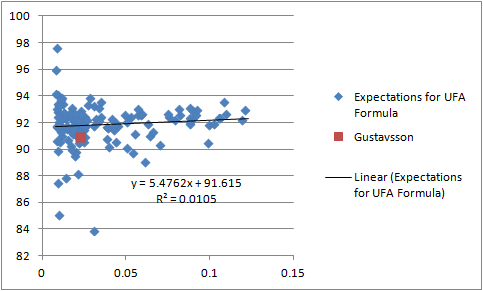 Well, looking at the UFA graph for the during-contract save percentage (graph 2), you see a flat trendline. This is bad news. What this tells us is that there is no indication that a higher cap hit will mean you will have a higher save percentage. There is a complete disparity between how much a goalie is paid, and how well they perform. 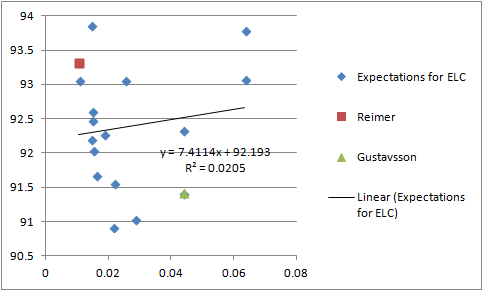 To illustrate just how bad this disparity is, take a look at the ELC during-contract save percentage graph (graph 5). See how the points are all over the place, and the trendline is barely near any of the points? 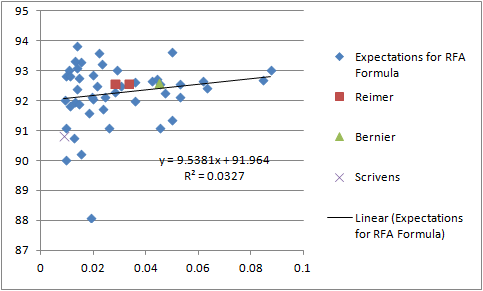 That trendline has an accuracy (R-squared) value of 0.0205. That's very bad. Graph 2's trendline has an accuracy of 0.0105. That's twice as bad. 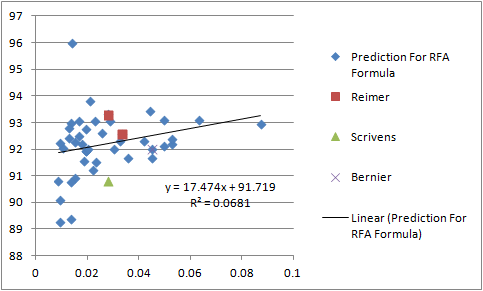 Graphs that inaccurate cannot be used for prediction.